between Tenerife's ancient Guanche people and the civilizations in Central America and Egypt. 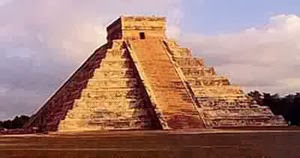 PYRAMIDS OF GUIMAR INTRIGUE -- ARE THEY CONNECTED TO OTHER IN DISTANT LANDS? sculpture, pottery copies, mummies and much more, as Cookie discovers. This inhabitant of Tenerife is happy in his environs. LONG BEFORE the coming of the Spanish, a curious and striking people inhabited the land of Tenerife in the Canary Islands. Although these people lived just off the coast of Africa, with its predominantly dark-skinned people, the original Tenerife inhabitants were blue-eyed and blonde. SO IT IS interesting that a blue-eyed, blonde explorer named Thor Heyerdahl fell in love with Tenerife and her pyramids. The world famous explorer and anthropologist studied the Tenerife pyramids and people, and made Tenerife his permanent home after he sailed the world's seas. 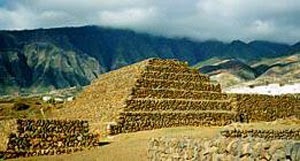 The famed Scandinavian established a ground-breaking Norwegian-Spanish project in the Canary Islands in 1990, chiefly to protect the newly identified step-pyramids. THE PYRAMIDS of Güímar are six rectangular pyramid-shaped, terraced structures, built from lava stone without the use of mortar. Like other of the world's mysterious pyramids, these attract speculation and create wonder. Is there a connection between their builders and other pyramid makers? Keller enjoys a sculpture in the Casa Charcona Museum. Heyerdahl became enthralled with this and the country's early inhabitants -- the Guanches. He spread the word about their artwork, religion, architecture and of course the pyramids, which he researched avidly, describing similarities to pyramids worldwide. Many scholars believe that blue-eyed hunter-gatherers roamed prehistoric Europe. Some ancient peoples in Spain 7,000 years ago had blue eyes and dark skin, while the Tenerife people were fair of skin tone. Heyerdahl compared pyramids from around the world. ALTHOUGH IT is unknown for sure how they arrived on the islands, the ever curious Norwegian and others proved that the Guanches shared various cultural characteristics with the ancient Egyptians. Heyerdahl also researched and wrote about their building style, noting that it seems to have been replicated in South and Central America. TO HEYERDAHL and others, though, the most stunning link between the Guanches and the Egyptians is the pyramids. The Guanche-built step pyramids use the same model as those found on a grander scale in ancient Egypt and Mesopotamia. Heyerdahl also noted that the Tenerife pyramids have an east-west alignment which indicates they had a religious purpose, associated with the rise and setting of the sun. The red dots mark the spots of the world's pyramids. of each pyramid lead up to the summit, which has a flat platform covered with gravel. Scholars surmise these were used for sacrifice or other religious or ceremonial purposes. Pyramid in Chichen Itza out of Cancun. The Tenerife pyramids resemble others, many believe. the island's charming museum, Casa Chacona. It welcomes visitors with pottery copies of Heyerdahl's famed rafts and videos, photos and clippings of his journeys and private and public life along with the curiously beautiful mummies. The island also offers a wonderful dolphin park and glorious beaches -- clean, pretty and peaceful.